http://www.JewishWorldReview.com | Suddenly, the world is seized with the danger of ignoring the Islamofascists in our midst. Lengthy front-page articles in Sunday's New York Times and Washington Post describe how British authorities allowed this virulent ideology-masquerading-as-a-religion to establish  and metastasize  into a veritable "Londonistan" in the years preceding last week's murderous attacks on the host community. The complacency shattered by the four bombs in London has been replaced with hard questions about the threat posed to other West societies. The French, Dutch, Germans and Italians are suddenly seized with the prospect that their own Londonistans are festering Islamist breeding grounds, sores that can at any time subject transportation and other soft targets in these democracies to the sort of bloodletting seen over the past fifteen months in Spain and Britain. Here in America, political correctness still compels the conversation to focus mostly on the vulnerabilities of our infrastructure and what is  or is not  being done to mitigate them. There is, however, a growing appreciation post-London that we can no longer ignore the fact that Islamofascists are hard at work here as well, seeking to dominate their co-religionists as the prerequisite for forcing the rest of us to submit to a new, global Caliphate under an unforgiving religious law called Shari'a. The one place we apparently are indifferent to the rising power of the Islamists is in the would-be state of "Palestine." There, the establishment of an Islamofascist Gazastan is not only being tolerated by the West. It is being enabled by the government of Israel, the G-8 and the Bush Administration. To be sure, the government of Ariel Sharon (which is determined to unburden itself next month of Palestinian populations in Gaza and parts of the West Bank), the leaders of eight industrial nations (who last week pledged $3 billion for Palestine) and President Bush (who has been a steadfast supporter of Israel and opponent of terror) have something different in mind. They envision a democratic Palestinian state living peaceably side-by-side with Israel. "The Palestinian Authority, and its leaders, are the godfathers of international terrorism. They developed airplane hijacking into a high art. They invented the high-profile murder of athletes and other prominent public figures. Were it not for their employment of terrorism, the Palestinian cause would today be regarded as the fifth-rate human rights issue that it rightfully is. But because the Palestinian leadership has always used terrorism (from the 1920's on) as the tactic of first resort, their cause has received worldwide recognition." The emergence of a new Arab state-sponsor of terror that is flush with Western cash and enjoys the protection of the international community will, of course, be a mortal threat to Israel. Having enhanced the stature of terrorists determined to destroy the Jewish State, Israelis will find the Islamists making a redoubled effort to do just that from their new safe-havens. The existential threat to Israel is made all the greater by the deep domestic divisions now evident over Sharon's so-called "disengagement" plan. 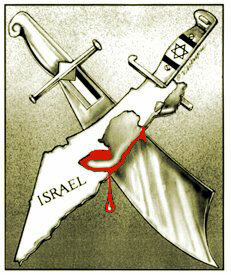 There is serious talk that a civil war may ensue over that initiative, which is now opposed by a majority of Israelis. Such a conflict is being fueled, in part, by secular Jews who seek to destroy the political power of their religious countrymen. Should anything approaching a civil war eventuate, Israel's Arab enemies must be expected to exploit what would thus be afforded: the best chance ever to realize their unrequited ambition to "drive all the Jews into the sea"  especially if, as is now being proposed, Israel were to allow Egyptian and Jordanian/Palestinian armies to return to Gaza and the West Bank, respectively. Gazastan will be a terrible menace for the United States, too. Such an Islamofascist state will not only threaten the very existence of Israel, our closest, democratic ally in the Middle East. Given the Palestinians' record of past treachery towards other Arabs, it should be expected to undermine the Bush strategy of bringing to power moderates elsewhere in the region. The creation of a new Palestinian safe-haven for terrorist recruitment, training and planning will also endanger Americans and their interests in Iraq, Europe, Asia and here at home. The fact that such terrorists will benefit from the counter-terrorist training, funding and arms we are giving the Palestinian Authority will only exacerbate this threat. For states as for individuals, the rule should be that friends don't let friends commit suicide. It's not too late for the U.S. to discourage Israel from doing just that by abandoning Gaza and parts of the West Bank under present circumstances  and the lessons of Londonistan make clear that we must.